A third culture kid is a person who has spent at least two years in a culture other than their own during their developmental years. It goes without saying that this international experience so early on brings a new world of opportunities for these children. The name emerges because children who move overseas develop relationships to not only to their home cultures but also the cultures they have moved to. Third culture kids often feel they do not fully belong to any specific culture but are a mixture of two or more cultures, thus the “third culture’.As a parent, you know that moving wit children can be stressful, and even more so when moving overseas. Parents should take every possible step to ensure a smooth move, avoiding undue stress both for themselves and their children. Despite the challenges of moving abroad, most third culture kids do gain many benefits from their move. In fact, research has shown that third culture kids have greater adaptability, improved mediation skills, wider global views, increased flexibility, and more insights into cultural and language knowledge. Organise formal goodbyes – It is hard to accept a new place without saying goodbye to the old one. Make time to meet with family and friends and say goodbye. Make sure to get addresses, emails and other contact details so your kids can keep in touch. Discuss the move with your child – Some children may be angry and not want to move. Acknowledge this. Don’t try to hide the move or avoid talking about it. Others will be very excited about the opportunity to explore a new culture. Remember there is likely to be a honeymoon period on arrival before reality steps in, but try to keep positive and enjoy the experience with your child. Read stories about moving – Stories let your child learn about how others in similar situations may feel and can promote discussions. 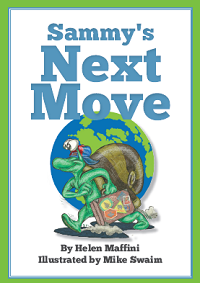 In my book Sammy’s next move, for example, children can learn about Sammy, a snail who carries his home on his back, so home is wherever he is. Research the country you are moving to with your child – Learning about the customs, traditions, places to visit, language and currency will help your child know what to expect and will build excitement about the trip ahead. To help you, you should look for travel guides that specifically target children. Keep to the routines and customs you had back home – But also keep in mind that it’s good to create new traditions and rituals. For example, if your family loves to go on picnics, try to find a place to do that in your new country. To bring your new culture alive, try and include some traditional foods from your new country into your picnic. Remember that part of the excitement of living overseas is learning new things and sharing your own culture with your new friends. You will most likely leave with a few new family rituals! Keep in regular contact with family and friends back home – This is easy nowadays with advances in technology. Email is an easy way to keep in touch. It is also nice to send packages with interesting items from your new country and to receive your favourite missed items from home. Helen Maffini, a Canadian, is an adult third culture kid. She lived in Japan as a teenager. Since then, she has lived in 11 countries with her Italian husband and two daughters. Helen is the author of Sammy’s Next Move, a book for children aged 3-10 who are moving overseas. She is also the developer of the family travel website http://www.family-travel-scoop.com where she designs children’s travel guides along with her sister Alison.